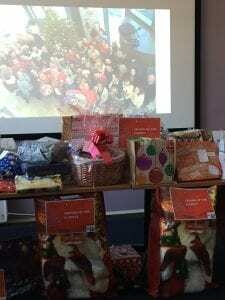 We have been overwhelmed by the support of Chertsey based company, ADP, this Christmas. The company runs an initiative called ‘Angel Tree’ where a Christmas tree full of gift tags is put up in their reception for members of staff pick a tag and buy a present for that person. Each tag is for a person supported by a number of local charities, this year including Friends of the Elderly in Woking. In total, the Angel Tree has meant that over 200 people in the local community will be receiving a special gift this year – some of these people may not receive any other present for Christmas. Friends of the Elderly in Woking has been presented with 40 gifts which will be distributed amongst clients and residents using our Bernard Sunley care home and our Triangle Community Services day care, home care and befriending services. 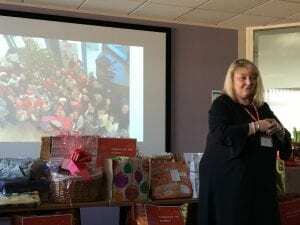 Yesterday, Kerry Reed-Brooke, our Befriending Volunteer Coordinator attended an event where she was presented with the beautifully wrapped gifts. Kerry said a few words to thank ADP and their staff for their generosity and explained just how much of a difference these gifts will make. Kerry, along with a team of volunteers from ADP, will be delivering the presents to recipients this week and we can’t wait to hear the reactions. We would like to extend a huge thank you to all of the staff at ADP in Chertsey for being so thoughtful and giving these gifts.